Tell me who you are. Where you're from. Tell me how long you've been reading my tales of the Trenches. hi, I'm Heather currently living in Virginia but a New Yorker at heart. I think I've been reading for about a year - I love hearing all your stories. Kiran, Virginia. I like red wine and long walks on the beach. (I am able to drink the red wine, but I can't get to the long walks on the beach, because I don't live near one). Um. It's been like 2 months-ish. Its Christi from Birmingham, AL! I have been reading your blog for about 5 months (I think) and I LOVE it! I'm Mrs. Fabulous, you know! From St. Louis, MO and I think I'm probably going on almost 3 yrs of reading! Could that be possible? I have a little boy so I LOVE hearing all the crazy boy stories from the Trenches! Hi! I'm Jennifer from Ohio. I've been reading for quite some time. Love the site! HI! I'm de-lurking even though I'll be giving you a big hug very soon!! Nic from Vancouver, Canada...it's been 4 months. It makes me feel better to read about your family chaos after dealing with my own family chaos all day. Hi I am Ann from the Midwest, living outside Atlanta. Not sure exactly when I found your blog but I've been reading for awhile. I am Lindsy, from Salt Lake City, and now, after trotting around on Pacific islands for a while, I am back in Salt Lake City. I have been reading for 20 minutes, thanks to whiskeyinmysippycup. Thanks for making me enjoy my day more. noelle from missouri...i've been stalking/lurking/reading/commenting for a couple of months now. I'm here, in eastern NC. I don't remember how long I've been following you- a few months? Something like that! My name is Annie and I'm an alcoholic. Oh wait, wrong one. My name is Annie and I'm from Denver (and I'm not actually an alcoholic though I do imbibe when I can). I'm thinking I've been following for about a year? In fact, yours was one of the 1st blogs I ever followed! I don't remember how I landed here, from someone else's blog I'm thinking. I've been reading for a bit, but I'm not a lurker. I'm more sporatic. I don't stop by for awhile, then I catch up on a couple of weeks and sprinkle in a comment here and there. I tend to lurk more than come out of the woodwork, but I'm pretty sure this isn't the first Delurking Day I've outed my quiet presence so it's been more than a year. Hm. I just don't know. Hi, I'm Amber. I can be a crappy commenter thanks to my two year old who demands my attention. I won that smoothie thing from you and I think my husband is more excited to get it than I am. He's all, "And when we get it, can we make smoothies?" It's like, YES TOM GEEZ! Hi, I am Nancy from PA. I have been following for about six months. I found you via a friend's blog, and love reading about your boyz. I have a six year old of my own, and I shudder at what is coming. I haven't been lurking--I actually comment once in awhile, but probably not often enough. How long have I been reading your blog, I have no clue...it's been awhile though..
Hi! I've been reading for awhile. I think I've commented a few times but I don't think I have lately. Hi, I'm Wonder Woman (a.k.a. awesome Amy) and I've been following your blog for the last 2 years at least. I love your blog, because it makes me feel good that my life is far less hectic. I also love your blog because it inspired me to start blogging! I read every post and try to comment a lot, although now that my blogworld is expanding, I'm going to have to figure out how to keep my comments meaningful but perfunctory. Is that the right word? I'm not sure what it means actually. P.S. I usually consult the dictionary at least once per post and often whilst commenting as well. HI, I'm Kimberly of kampkk.blogspot.com and live in San Antonio. I don't know, maybe I've been around here about 5 months? Love your blog. I'm stopping by from SC and I am the author and owner of The Green Hanger Shop, an online eco-boutique for preowned dresses. This is my first visit! I'm Stephanie, i live in PA, and i have been reading your blog for only about a two months...but i love it! I'm Michelle. Live by Rochester, MN. And I've been reading for a few years now! I think the very first post I read of yours was the puking the night before vacation story! And i was hooked ever since! I'm Dorothy and I have commented on your blog on occasion, so not an official lurker. I live in NJ and found your site through Cha Cha. I have been reading it for about 8 months. No blog. No kids, but I enjoy reading blogs that are well written. Well done, Sarah! Hey there - I'm Wisconsin Mommy but am a Boston girl at heart (after 6 yrs of living there). Been reading you for quite some time - have lost track really. I think it's similar to when I sit down to check my feeds and then suddenly four hours have gone by! I have commented on her before, but I don't do it often, and as of today, you're now following me on Twitter as I've been following you. I apologize for all my Soccer tweets now. I'm a huge Arsenal fan, and a lot of the people I follow on Twitter are fellow Arsenal fans and soccer writers, but there's other stuff, too. Anyway, I just love your reading your blog even being single, 35 and no where in the realm of getting married or having children at this time. But I do have a 2 1/2 year old niece, who I see regularly, so I know the stories of children and my sister's bout with PPD, as well. So as much as I can't relate, I feel like I can relate to some extent. So glad your job is working well and that you're closer to home without the long commute. Hey Sarah! I'm Stephanie from Newburyport MA. Found you via I am Bossy and have been hooked ever since. Love your blog and reading other MA mom adventures! I've been reading your blog for a few months now - I love your stories and 'knowing' your family. It is truly a pleasure for me! Hi - I'm Melissa (Momlissa) I've been reading for a while! I love your header, "and then I had children." Boy, can I relate to that. I am a California working mom to 3 small children (4.5 yr old girl and 2.5 yr old boy twins). Hi I'm Katrina I'm not really sure how long I've been reading but I LOVE your blog! I'm from Central MA and I have 3 boys 6,4,2 so I feel like I TOTALLY get everything you write about! I don't have my own blog I tried once but just couldn't make it work. I might try again, we'll see. 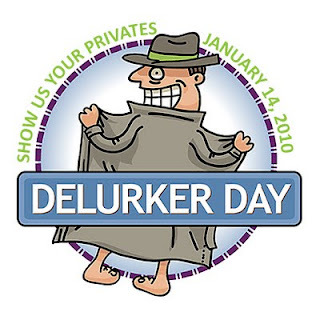 Anyway thanks for delurker day I feel less like a stalker now LOL!! Hi there! It's Mindy from www.thesuburbanlife.com and I've been here for about 7 minutes. I'm already hooked. I'm Alison from Georgia. I've been reading you for several years. I don't know if I've ever commented before. I'm Mary in Nebraska and I am unfashionably late to the party! Love your Blog! I live in the Boston area and also have three children (all girls, though!). hi! It's Erin from YAY!DIY. I've been reading your blog for a while - I love your honest confessions. Though I'm not a mom yet (although, hopefully one of these days soon!) your stories are helping me prepare for what's ahead! Thank you!!! Hello, I'm Kim from Ohio and I have 2 boys...I'm this my first visit. Your blog is so fun to read! Thanks!